There is no doubting that Australian employers face recruitment constraints. Economic pressures and volatility, labour regulations and skill shortages in particular industries have persistently troubled organisations when seeking accurate recruitment practices. It goes without saying that when managed ineffectively, these challenges can cause significant costs to organisations. As a result, employers who undertake strategic recruiting can gain significant advantages – when they execute it correctly. Strategic recruitment integrates recruitment practices with an organisation’s broader strategic plan, and determines the most appropriate employment practices, segments and contractual arrangements in order to best meet corporate objectives. Often assistance is required to help streamline the recruitment process and labour placement in the most cost efficient and effective manner, with comprehensive alignment to strategic objectives; hence the partnering role we here at Options Consulting Group occupy. 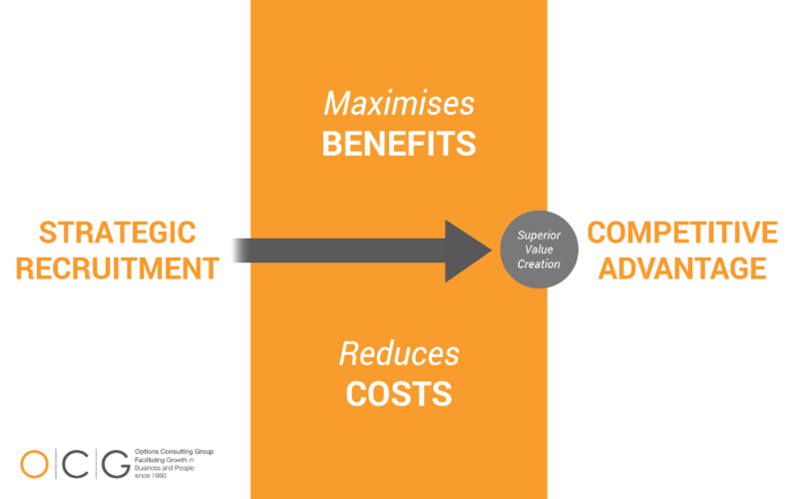 Through maximising benefits and reducing the costs – a practical implementation of an effective cost-benefit analysis – strategic recruitment can lead to a competitive advantage. A competitive advantage is characterised through an organisation’s ability to generate greater value in comparison to competitors; the convergence of maximising labour placement effectiveness with reducing recruitment costs and variable risks achieves the superior value required to be more effective than competitors. After all, recruiters are responsible for arguably the most important resource allocation activities an organisation can undertake. Options Consulting Group has an established reputation built over more than 27 years for partnering with its clients to achieve maximum value and mitigate risk in the selection an hiring process.